CBD of London Skincare, UKs first skincare range to use CBD (Phytocannabiniod) oil. Everyone is always on the lookout for the latest skincare anti-ageing ingredient. Well, we think this is the hottest one in the market right now! CDB oil in skincare is a new natural skincare ingredient that is quickly making its way into the market. Recently legalised in the UK, CBD of London is the first company in the UK to use CBD in its skincare products. We have been excitedly trialling CBD of London entire skincare range and are excited to share the benefits with you. CBD, is Cannabidol, a compound form in the Hemp and Cannabis family. It is a purified version and you can’t get high on it (non-psychoactive). It is a compound which is harvested from the Cannabis plant. What are the benefits of CBD (cannabidol)? It is known to have beneficial effects for those who suffer from eczema, acne and psoriasis. Taken internally, it also shows remarkable results for health, despite currently limited research. 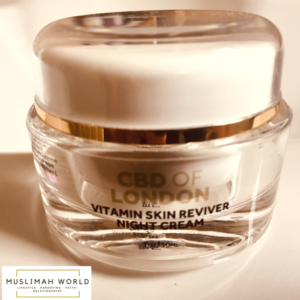 The CBD of London skincare range currently consists of three products: Collagen and Retinol Anti- Ageing Cream with Pure Hemp CBD oil; Advance Bright Eye Repair Serum with Pure Hemp CBD oil and Vitamin Skin Reviver Night Cream with Pure Hemp oil. This sleek white and gold airless pump dispenser bottle comes in 1oz/30ml bottle. Directions state to apply no more than 3-4 times daily. It contains extremely nourishing skincare ingredients such as Collagen, Hemp Oil, Vitamin E and Vitamin A and Vitamin C.
This is a super nourishing, yet light cream which seems to plumps the skin almost instantaneously. Over time it smooths out fine lines and wrinkles for a smoother and more youthful and radiant complexion. This product is fragrance-free and doesn’t irritate. My usage: The product went on lightly, without feeling too light. It definitely made my skin look more radiant and it felt smoother. This 0.47oz/14 ml syringe type packing is flawless for precision application around the eye. It contains Hyaluronic Acid, Aloe Vera Leaf Extract, Cannabis Saliva Extract, Retyinl Palmiateta, Silica Tocopherol Acetate. 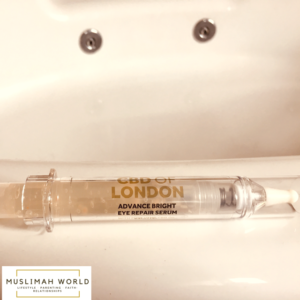 This super potential serum has been specially formulated with the sole purpose to include rejuvenating ingredients to aid and replenish the skin around the eyes. It hydrates and firms the skin around the eyes with its super ingredients of Aloe Vera, active Cannabis Sativa extracts and skin-firming collagen. My usage: It left the skin around my eyes looking revitalised and more luminous. The darker circles under my eyes looked lighter. The Vitamin Skin Reviver Night Cream is contained within a sleek jar of 1oz/30ml. It contains natural skincare ingredients of Jojoba Oil, Hemp oil, Vitamin A and C and hydrolysed Collagen. This rich cream hydrates the skin leaving it feeling soft and rejuvenated. Enriched with Vitamins A and E for skin protection and Jojoba oil for skin softening. The phytocannabiniod rich CBD extract gently but effectively softens and plumps the skin, improving the appearance of fine lines and wrinkles. My usage: I apply it last thing at night, after my cleansing routine. The cream makes my skin feel instantly smoother and my skin definitely felt softer on awakening. It also seemed to improve my fine lines. What is so special about CBD oil? CBD is high in antioxidants, Omega 3 fatty acids and Vitamins A, C and E. This potent combination found in CBD oil are all essential components for anti-ageing skincare. These compounds help protect the skin from environmental pollutants and free radicals in addition to nourishing and improving the skin texture. These compounds also help keep free radicals from damaging elastin and collagen in the skin, which keep the skin tight and bouncy. Vitamin A also helps skin look healthy and aids skin repair. A lack of these vitamins would result in skin dryness. Vitamin A also has a role to play in skin cell growth, by inhibiting oil production and promoting skin cell differentiation. It works with your own body’s internal endocannabinoid system, meaning it works with your body rather than being just on it. People who have used it say they see a reduction in symptoms of psoriasis (extremely dry skin) such as eczema, dermatitis, acne and seborrhoea. The oil itself when taken internally has been shown to improve anxiety and depression, aid sleep, relieve pain such as from arthritic conditions or fibromyalgia and others, aids skin irritations, helps autoimmune diseases and aids symptoms of epilepsy and autism. It has been approved in Canada for multiple sclerosis and cancer pain and according to the National Centre for Biotechnology Information, it aids inflammation reduction in diseases such as heart disease, cancer, Alzheimer’s and other autoimmune diseases. There are so many benefits of CBD oil in skincare and to improve health, that it is definitely worth a try! 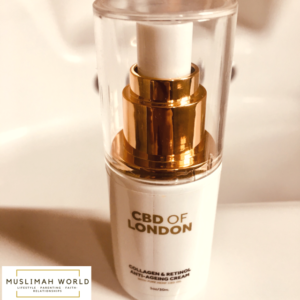 The CBD of London range contains many beneficial and skin nourishing ingredients, as well as the star of the show and the hottest, trending, current skincare ingredient- CBD oil! ← Philips Lumea Prestige on brown Asian skin compared to IPL, sugaring, waxing, threading, Soprano or ND Yag? 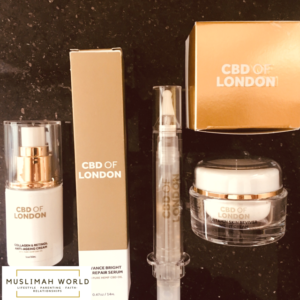 These look good, will definitely try CBD if London skincare products.